gather the folks. tell the stories. | Therapist. Pastor. Storyteller. For the past two years, I have been living into a bi-vocational ministry that seemed to make sense to me and no one else. That is, until the lovely folks at the Interfaith Center of New York asked if I would be willing to do an interview for their new podcast series. For the first time, I found myself speaking out loud about the winding journey that has led me to this moment in my ministry– engaging the full lifecycle in my therapy work with the Psychotherapy & Spirituality Institute, and in the liturgical life of Waffle Church. The words may be different, but the language is the same. The actions may vary, but the search for meaning is our commonality. Host of Interfaith Matters, Maggi Van Dorn, and me. The Psychotherapy and Spirituality Institute, The Interfaith Center of New York and The Jewish Board of Family and Children’s Services are proud to offer an annual continuing education conference for social workers and their colleagues. The Social Work and Religious Diversity series helps social service and mental health care providers work effectively with religiously diverse clients, and offers continuing education credit hours for New York State LMSWs and LCSWs. Our next full-day conference will be held on Wednesday, May 10, 2017. It will feature diverse local religious leaders, scholars, and faith-based service providers, exploring the intimate ties between Religion, Spirituality, and Family Life. Please click here for a program and other details about the conference, click here for brief biographies of our speakers, and click here for conference registration. We hope you can join us on May 10th, to explore the religious lives of diverse New York families. Rev. Sarah McCaslin, MDiv, LMSW, is an ordained minister and licensed social worker whose career has been devoted to fostering the human capacity for resilience, growth, and meaning-making. She graduated with dual masters degrees from Columbia University School of Social Work and Union Theological Seminary in 2006, and was ordained by the Presbyterian Church (U.S.A) in 2007. She currently serves as a Resident Therapist at the Psychotherapy and Spirituality Institute, and as Waffle Church Minister at St. Lydia’s – leading services for children and families at a progressive Brooklyn dinner church. 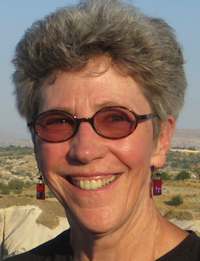 Dr. Mary Ragan, LCSW, is the Executive Director of the Psychotherapy and Spirituality Institute, and an Adjunct Professor at the Columbia University School of Social Work, where she regularly teaches a course on “Spirituality and Social Work.” In addition to her work as a clinician, administrator, and educator, Dr. Ragan has served as a consultant to a wide range of faith-based and secular organizations. Her research has explored the contours of traumatic grief, and she has done trauma work with first-responders and family members after 9/11, and with survivors of Hurricanes Katrina and Rita. Why Study Social Work and Religious Diversity? Because to make a difference in today’s New York, mental health and social service providers need a rich understanding of the religious lives of the people they serve. The religious landscape of the United States has shifted dramatically in recent years, with the arrival of new Americans from every corner of the globe and every faith tradition. The changing face, and faith, of America may be seen in the diverse client-base of New York City’s social workers. The religious beliefs and values of many New Yorkers shape their views of pressing social issues – child welfare and youth development, mental health and depression, substance abuse and recovery, sexuality and LGBT relationships, immigration and assimilation, aging and end-of-life issues, and many others. In order to work effectively on these issues, New York’s social workers need to understand the religious beliefs and practices of the clients and communities they serve. Because the city’s diverse faith traditions offer valuable insights and resources that can enrich your practice as a mental health or social service professional. Whether or not you are a faith-based provider, and regardless of the populations you serve, you can learn a great deal by engaging with your religiously diverse colleagues. Your practice might be enriched by Christian understandings of personal faith and transformation; by Jewish understandings of “tikkun olam,” or the repair of our painfully broken world; by Muslim understandings of the dynamic balance between justice and compassion; by Buddhist understandings of mindfulness and non-attachment; by Hindu and Sikh understandings of “seva,” or selfless service; by African diaspora or Orisha understandings of the reciprocal ties between the social and spiritual worlds. In all these ways, and more, an engagement with religious diversity can transform your practice as a social worker. “Why can’t you?” I asked, incredulous. What are the requirements to receive the Lord’s Supper? Baptism? Confirmation? A sinless life? Spiritual hunger? An inkling? A curiosity? A longing? My answer came easily to this woman whose hunger was palpable. Does the same hold true for children? Are they ‘equipped’ to receive communion? What are the requirements? Age limits? 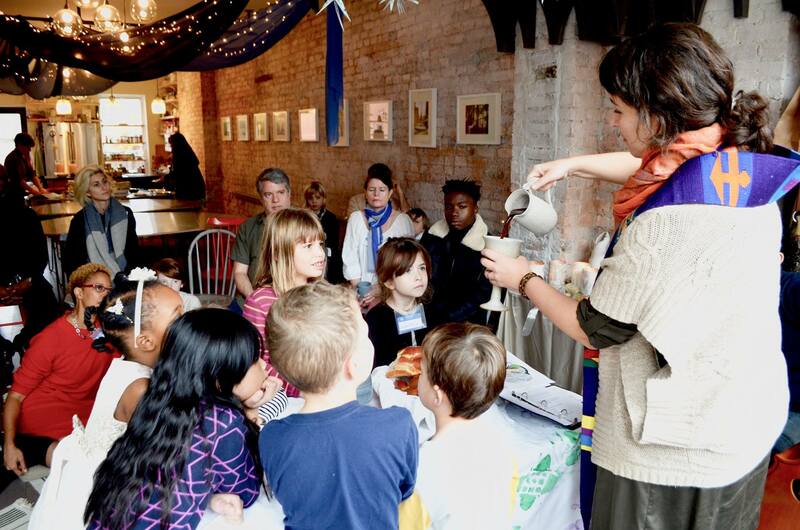 At Waffle Church, we believe that it is in the practices of faith, in the hearing of the story, in the sharing of the meal, in the living in community, that the formation of faith occurs. Not the other way around. Come and eat. Then go and serve. I came across the following passage from Elizabeth Frances Caldwell’s book, Come Unto Me- Rethinking the Sacraments for Children. But as I think about this woman, and I think about the child she once was, I believe this applies to people of all ages. What if the requirements for communion are not on those who would come and eat, but on those who set the table and extend the invitation? What would the table look like if that were true? I preached this sermon to the lovely folks at The First Presbyterian Church of Forest Hills, Queens, on the first Sunday of Advent, November 29, 2015. There’s no excuse, really, for the unpreparedness. The first Sunday of Advent is always four weeks before Christmas, often on the Sunday after Thanksgiving. I don’t think it’s the failure of our calendars, or the speed of time, or the million distractions that cause us to be so surprised when Advent pops up again, as it’s supposed to, predictable, reliable, fixed. I think Advent begets a certain kind of mini spiritual crisis, when we find ourselves on the brink again, and no better off than the last time. It is our liturgical New Year, when we set our resolutions and review our accomplishments or failures from the year before. Did we succeed in distancing ourselves from the commercialization of the holiday like we promised ourselves that we would do last year? Did we inaugurate a family tradition of reading the Scripture passages in the little windows of the Advent calendar and reflect on their meaning? Did we drink less and pray more? Did we spend less and give more? Did we do the baby Jesus proud? Did we heed the apocalyptic warnings of the Gospels? The calendar of the church sits at an odd angle to all the other calendars in our lives. The yearly calendar, the school calendar, the program calendar, the fiscal calendar. The church calendar is plopped down in an awkward spot, when we are already predisposed to busy-ness, what with the encroachment of winter, the end of the school semester, year-end budget negotiations. Christmas, broadly conceived, doesn’t even seem to belong to the church calendar anymore, coopted, as it has been, by a cultural Christianity that is watered down to near oblivion. Luke thought the Son of Man would come in great power and glory before his grandchildren were grown up. His was not an abstract warning or prophecy, it was a ‘let’s pack our bags and pull the kids out of school and close our accounts’ kind of urgency. And the signs were there- the distress among the nations, the roaring seas, the fear and foreboding, but not the kingdom coming near. Not the return of Jesus to tie up history in a bow and wipe the slate clean of the mess humanity made of God’s good Creation. The Bible is a series of stories on the brink. Moses looking at the Promised Land he would never touch. Jeremiah awaiting the return of the Davidic dynasty to set the record straight. The Psalmist, waiting all the day long for God’s guidance and deliverance. Paul, Silas and Timothy, praying to be reunited with the church in Thessalonica. Advent is when we join our ancestors at the brink, looking over the edge and awaiting the promised guidance and deliverance of God. And Lord, do we need guidance and deliverance. Is anybody here not on the edge of something? You are on the brink this very day, at the end of this interim and awaiting the start of your new pastor. That’s an edge you’ve balanced on before, quite a bit, in fact. You have, I imagine, become accustomed to in-between times. You may have longed for pastoral permanence at the same time that you gained surer footing in your lay-led ministries, keeping the church not just afloat, but vital. This has been an Advent season for you. And I pray that your Advent season concludes with celebration and new life. With the promises of sustained leadership. With the collapsing of tired muscles into a strength that can hold you up as you recover. With the hope for stretching even further beyond the bounds of this sanctuary and out into the community and world. He will not solve every problem and shoulder every burden. But he will be there to wipe away your tears, to stand vigil at the bedside, to preach a good Word, to provoke a new conversation, to break the bread and bless the cup, to feed you and be fed by you. This Advent season, you will stand on the brink together, gazing into the future of this church, expectant, and maybe a little fearful. You will stand on the brink together, gazing into the future of the world, expectant, and maybe a lot fearful. If you are lucky, or, not so much lucky as persistent and patient and stubborn and clear-eyed and discerning, you will see the star at its rising and you will know that despite the churning waters and billows of smoke and the bodies of innocents strewn on the streets like felled bowling pins, the kingdom of God is indeed drawing near. The veil between earth and heaven will lift just a little on Christmas, and we will see God slip past the curtain and curl up in a manger, prepared to join the fray, for the sake of love. Advent, properly celebrated, isn’t just about this single, miraculous, love-drenched moment. Advent is about standing at the brink and proclaiming with as much confidence as we can muster, that all of life — past, present, and future — is lived in the presence of God, not just that one, improbable moment when the cry of an infant sounded like the cry of victory. Advent is about trusting in the promise of that victory even while awaiting for the promise to be kept by God. When we are on the brink – from illness or failure or disappointment or heartbreak or calamity or oppression or depression or burnout or whatever – when we are on the brink we receive a keenness of vision– that we are insufficient, that this world and reality is temporary, and that we stand in desperate need of the miraculous, of salvation, for that which is merely possible cannot save. And if we are lucky, or, not so much lucky as persistent and patient and stubborn and clear-eyed and discerning, we will catch a glimpse of the star at its rising. Not two miles from here, this past Tuesday morning, Jose Moran set up the Nativity scene at the Holy Child Jesus Church in Richmond Hill, where he is a custodian. He put up the manger, and went to lunch. And when he came back at about 1 p.m., he heard the cry of a baby. The baby was in the manger, swaddled in blue towels. He was so young his umbilical cord still sprouted from his belly. Sometimes, we catch a glimpse of the star at its rising. To help us see beyond our present. To give us a lens through which to see God at work when it seems only evil gets the spotlight. Advent finds us at the brink, or invites us to the brink, to peer behind the curtain and see the Child of God coming in power and glory. The first thing that happened is a reporter from the Wall Street Journal called me and said, “Someone told me about this thing called ‘Waffle Church,’ and I just had to find out more.” And then she proceeded to write the loveliest summary of St. Lydia’s and Waffle Church in an article about the changing format of religious education for children in churches. And then, on Sunday, we got to do Waffle Church again, for only the fifth time in as many months, and it was just as magical as every other month. It feels like a dream sequence, really, with magic dust falling upon our heads like so much glitter. The children bellied up to the communion table, wide-eyed, as I tell that familiar story, which is becoming their story. Whose table is this? I ask each time now. THE LORD’S!! they cry, before ripping large hunks of soft challah and dipping them lustily into the grape juice. And the music… oh, the music. Rebecca Stevens, our “Waffle Church intern” who is the magician musician who moves us through the liturgy as if through silk. Who guides little hands into platters of glitter and hangs the stars in the sky with invisible thread. We met the priest Zechariah, who came to tell us his story. We all thought he looked a lot like Zachary Walter, but it was just a strong resemblance. He made me tell his story, when we realized that he didn’t have his voice! The angel of God had come bearing good news, but Zechariah was doubtful. How will I know when this good news has come to fruition? How will I know that God’s word is trustworthy? Poor Zechariah, that’s the last thing he said for a matter of months. It’s a wonder we aren’t all walking around without our voices. Doubting, as we do, the good news that God promises to deliver. Holding our breath when good things happen; standing very still, trying to keep that iridescent bubble balanced on the tips of our fingers. That’s the Advent challenge, isn’t it? To believe the good news will come to us. To trust that God’s Word is trustworthy. We pray fervently for peace in France and Lebanon and Syria and Mali and Kenya and the streets of our own cities. We lose sight of the light that shines in the darkness. I lose sight that Waffle Church does not belong to me; it does not even belong to St. Lydia’s. To whom does Waffle Church belong? TO THE LORD!! they cry. And they are right– these ones bellied up to the communion table… hungry. 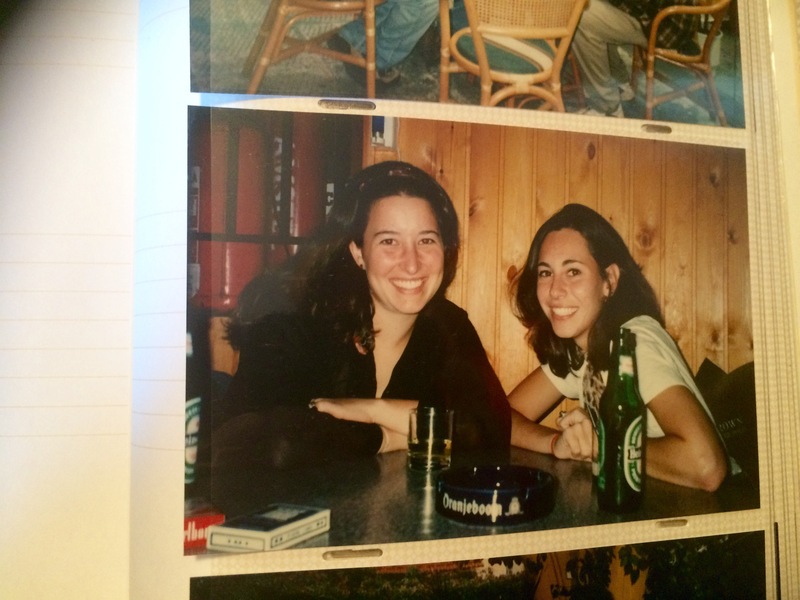 In 1997, when I was 20 years-old, I decided, all on my own, to spend my junior year of college in Israel. I was obligated to begin my year with an intensive course in modern Hebrew, and I was given a choice- study in Jerusalem (where I would ultimately spend the rest of the year), or spend the summer on a kibbutz, splitting my time between working and studying. And so I departed for Ein HaShofet, an “Anglo-Saxon” kibbutz near Haifa. 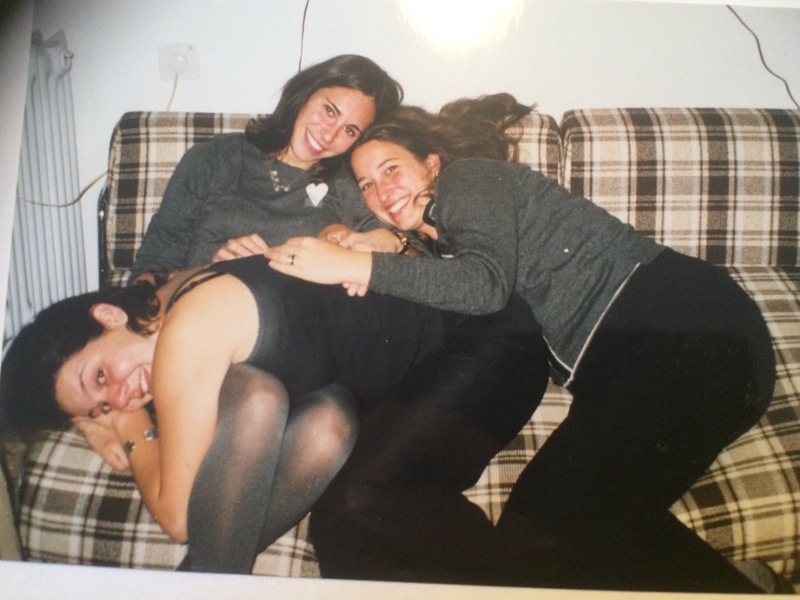 I spent the summer in the kibbutz with 26 other American college students. We could work in one of two factories on site (there were, unfortunately, no available positions in the avocado orchard). We got up before dawn, had a large communal breakfast, and then set out for our work. This is where I was when I first met Rachel Pearline. A junior at Brown University. Skinny and boisterous. 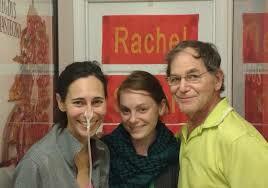 Effusive and disarmingly generous, Rachel was, in some ways, the sun around which the rest of us orbited. We loved her (and some of us fell in love with her). The author and Rachel, 1997. The kibbutz was well-equipped for American college students with an outdoor pool and a small bar called The Barrel, where students and kibbutzim spent ‘tickets’ on cheap drinks and danced to the latest and greatest techno music (it was also the year of Will Smith’s, Men in Black). We studied; we worked; we partied. On Friday evenings, we gathered outdoors to welcome the sabbath with an informal “Kab Shab,” breaking the homemade raisin challah prepared by our one, Mennonite student. We traveled around the country; we forged intense friendships with one another. We sometimes argued like brothers and sisters. 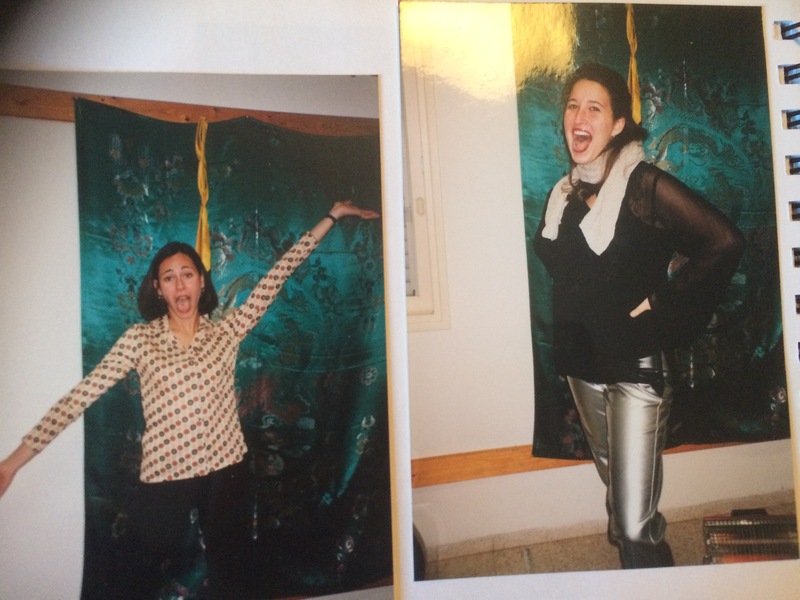 At the end of the summer, we moved into the dorms of Hebrew University, along with hundreds of other students who could never understand what they had missed by choosing to do their language intensive in Jerusalem. We, the American kibbutzniks, were a merry band of outsiders. We stayed close. We shared our first Thanksgiving together away from home. It was epic. Rachel helped me make a pot of rice pudding that would have easily fed a small nation. We ate until we literally fell over one another, napping on the floor and futon. We were light-headed with joy. 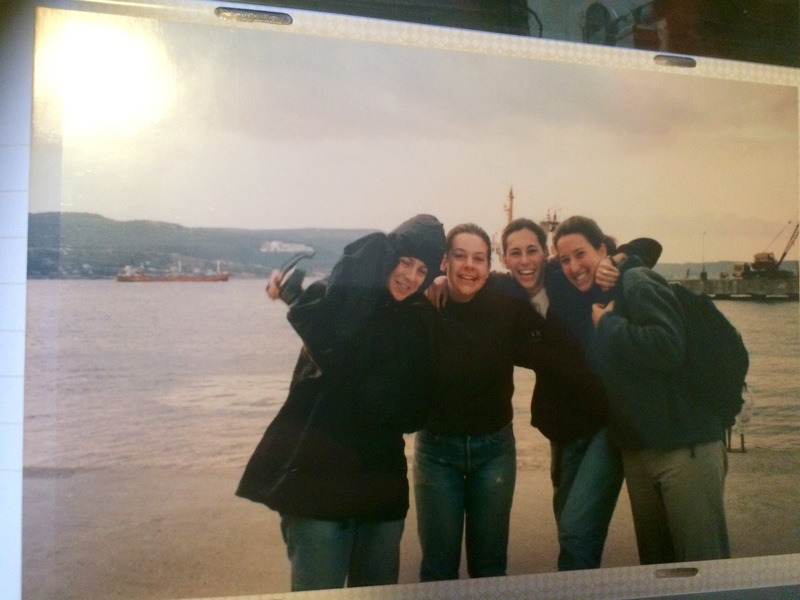 During fall break, we decamped to Turkey and Greece, a roving band of brown-haired girls in jeans and bulky backpacks. We drank sweet apple tea in Istanbul and haggled in the bazaar. We sample ouzo in Taksim. We wore trash bags on Rhodes when the heavens opened in a torrent of rain. We found a tiny restaurant in Athens that served a rice pudding that put ours to shame. We saw the ruins at Delphi, but the oracle was silent. Now that the memory muscles are warm… the stories are flooding in. Trips to Petra; climbing Masada; sleeping under the stars in the Golan. Stealing away to Tel Aviv to get our tongues pierced, thinking we were so rebellious when you could not have found two more responsible young women than Rachel and me. All this in a span of less than one year. A whole life lived in a span of a few months, or so it seemed at the time. Rachel was my accomplice, my dance partner, my travel companion. And still, she was as much and more to others. Hers was a deep well of joy and grace; there was always enough Rachel to go around. Thinking we are rebels. Decidedly not. We passed in and out of each other’s lives after that. Trips to Providence to see her; trips to Georgetown to see me. A West Coast road trip to reunite with the scattered kibbutzniks. The turn of the millennium celebrated in a cramped East Village apartment. It was when we were both in New York, just after college, that I, feeling insecure and unsteady in my independence, grew envious of her easy popularity. Did she recognize me as I pushed her away? Probably. 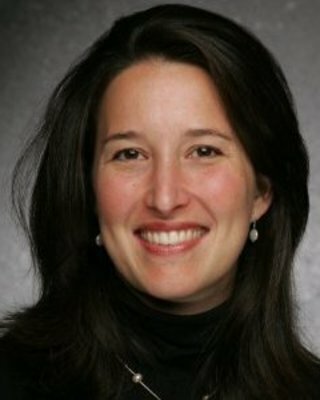 Would she have ever confronted me for my bad behavior? Never. That she reentered my life as she prepared to leave her own is a sadness that will haunt me for quite some time. Yet who can really be sad when thinking about Rachel? Upon how many thousands did she shine the radiance of her smile? And not just her smile; not just her joy. But her insatiable appetite for the world– places, yes. But people, more. And her commitment to the Tikkun Olam, the repairing of the world, one patient at a time. Not unlike Oliver Sacks; himself a doctor, a wanderer, with an insatiable appetite for the world– places, yet. But people, more. Is this not our Rachel? I was not there these past two years. But others were. Tell me that I’m right, that Rachel possessed, throughout her illness, the same ardor in her study, the same gaiety in company. I wasn’t there, but I know I’m right. She died as she lived. In full possession of a gratitude that the most religious of us hope to find in some small measure, but she had in easy abundance. Oliver Sacks died on August 30, 2015. Rachel Pearline died on November 5, 2015. He was 81. She only 38. I have come to believe that they are kindred spirits, each leaving an indelible mark on the world they inhabited with a passion unmatched by anyone, save perhaps one another. Farewell, good and faithful servants. God, filled with mercy, dwelling in the heavens’ heights, bring proper rest beneath the wings of your Shechinah, amid the ranks of the holy and the pure, illuminating like the brilliance of the skies the souls of our beloved and our blameless who went to their eternal place of rest. May You who are the source of mercy shelter them beneath Your wings eternally, and bind their souls among the living, that they may rest in peace. And let us say: Amen. I preached this sermon, ‘Love Supreme,’ on October 25th, 2015, at Good Shepherd-Faith Presbyterian Church, in the shadow of Lincoln Center. and to share the love of Christ by reaching out to those in need. Though the government has given us a long weekend, conceivably to remember the long journey of Christopher Columbus to ‘discover’ America, a place that was, in fact, already both discovered and inhabited, our lives look pretty much the same today as they did three days ago. I imagine that some of us are here today with a sense of peaceful well-being and gratitude for an extra day to rest. No schlep to the office or to get the kids to school; a morning without an alarm clock- Hallelujah- and time to savor a cup of coffee at your kitchen table instead of in the car or on the bus! There are others, I imagine, who might be wishing that Monday wasn’t a holiday, because it means one less day of employment when every paid hour counts. It may be a day of financial anxiety and restlessness. Some of us might have entered the church this morning in heartbroken disbelief that there have been two more school shootings, barely a week after the tragedy at Umpqua Community College in Oregon. The trajectory of the life of faith arcs toward the promise that at the end of our time on this shore, another life awaits on another shore, in the eternal care of a God who knows life both mortal and eternal. But how will we get there? How will our actions and decisions, or our inaction and indecisions, influence our fate? How can we get confirmation from God that we are on the right track? That despite all evidence to the contrary- illness, heartache, persecution, loneliness- we are, in fact, heading on ‘the Way’? We proclaim that eternal life is a gift from God that cannot be earned, but is given freely. We cannot merit salvation; for no one is good but God alone. And God who is good has more in store for us than we can imagine, and certainly more than we could effect on our own. But that’s not the first thing Jesus says. It’s a bitter pill to swallow for this pious, heartfelt man, because it does, in fact, seem impossible to him. To sell everything and give it to the poor. To leave behind the former life. To not look book. To embark upon the Way, which is, you might remember, a term Jesus uses to describe himself- the way, the truth, the light. If it’s harder for one with wealth to enter the kingdom of God than a camel to pass through the eye of the needle, it seems to me that we ought to take a closer look at that camel! 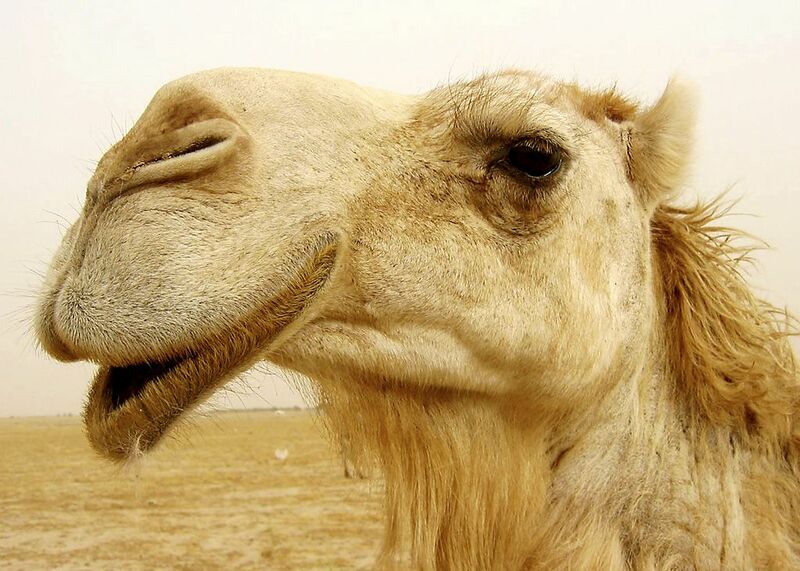 It’s not the camel’s long legs or bulky humps that make it difficult (but not impossible) for the camel to get through the eye. Camels were pack animals. It’s the saddlebags draped across the camel’s back that prevent its passing through. The camel sheds its saddle bags and squeezes through. The bags aren’t his anyway; nothing lost to let those go. But we and our bags? That’s another story. Our saddlebags are weighed down with books and mementos, clothing and tchochkes. It doesn’t take much to toss those bags to the side, or donate them to a worthy organization. There’s even a faddish book about a Japanese cleaning method that can tell you how to do that. There are heavier bags, though, and they are filled with accomplishments– master’s degrees and promotions at work, grade point averages, and award-winning recipes. Sources of pride and achievement take up a lot of space and can’t readily be donated to the poor and needy. Maybe the heaviest bags of all are the ones filled with our commitments and relationships, and with our hopes and dreams for the future- the promise of retirement and grandchildren, of new relationships and exciting adventures. Who could lay aside such possessions as these? 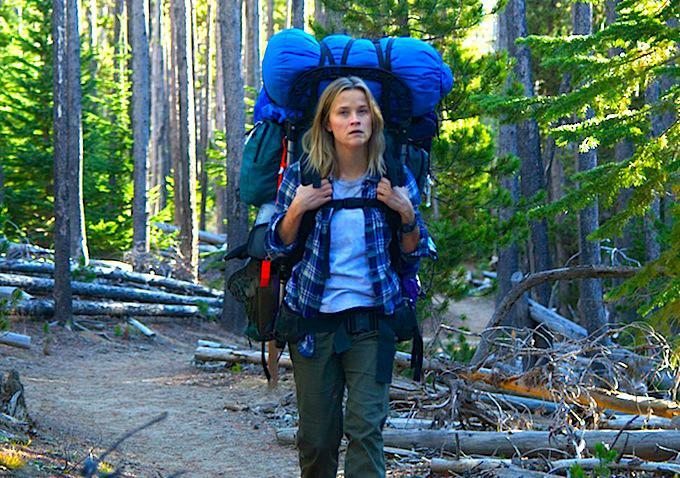 In the movie, Wild, the actress Reese Witherspoon portrays Cheryl Strayed, a young woman embarking on the Pacific Crest Trail after the death of her mother and the end of her marriage. In a roadside motel, on the night before her departure, Strayed adds the last few items to her pack- a pack that weighed at least as much as she did and contained, essentially, her entire life. She can hardly stand up; she can barely move. But she gets out of the hotel the following morning, and sets out on the trail. Within minutes, the path before her no longer looks like the way to the transformation, but a prolonged trial of torn skin and oozing blisters and aching muscles. Her spirit flags, and she approaches camp with an encroaching despair. A man appears, a seasoned hiker, and he surveys the contents of her pack. Items that Strayed believes are just the barest of essentials- a water purifier, journal to write in, paper maps, underwear, food, a camera, windbreaker, headlamp, books to read, iodine tablets, a small pot, plate and utensils, extra fuel for the camping stove. The seasoned hiker looks, and he laughs. He laughs and laughs and starts to grab items from her pack and throw them in a box beside the trail. And Strayed, well, she yells at him, tries to grab them back, dumbfounded by what this man is liberating from her heavy pack. She protests and makes her argument, I must keep this. How can I possibly survive without it? And, I can’t remember exactly what he says, but I wonder if it is something like this- You’ve got it all wrong. The question is, How will you survive with it? We ask of Jesus, how can I possibly survive without this? And Jesus says, You’ve got it all wrong. The question is, How will you survive with it? And Jesus loves him. And Jesus sees that all this guy has – his knowledge of the law, his perfect piety, his abundant wealth – has distorted his sense of himself, and of God, and of his neighbor. And so Jesus tells him to divest so that he can really live by faith in God and in solidarity with neighbor for the first time in his life, which would be like having, when you think about it, treasure in heaven. If this is true then Jesus might just be doing the same thing to us even now. Jesus might be looking at us with love and, perceiving the deep heart sickness in each of us, actually asking something of us, giving us something to do, something to give up or away, somewhere to go. This is not about our salvation; we are saved by grace through faith for Christ’s sake alone. But what if it doesn’t end there? Or better, what if, in one sense, it only starts there. That is, what if God isn’t only concerned about our eternal destiny but also cares about the life we enjoy here and now, with each other in God’s creation. But of course that’s hard. Deep down we’re too scared (and often as a result too selfish) to do that for long, too scared and selfish and insecure and competitive and controlling and judgmental…and so many other things. Because when push comes to shove, we still don’t feel like giving up all we have. Which is why Jesus comes and makes these demands, naming whatever idol we’ve created and asking us to give it up, throw it away, for the sake of our neighbor and ourselves. I wonder what Jesus might be asking of you right now? As individuals, as a congregation. You and I have just met, so I don’t know what it is you might be holding on to. But I know a little about churches. Churches can look a lot like Cheryl Strayed’s backpack, stuffed with all sorts of things that might come in handy, or ‘could’ be useful somewhere along the way. I’ve been in churches with storage closets filled to the brim with old hymnals, binders of Session minutes from thirty years ago, cracked silver platters, and dusty, moth-eaten paraments. But instead of clearing out that closet to fill it with canned goods and toiletries for the hungry and homeless, the closet stays as it is, waiting for the past to catch up and become the present again. I’m not giving away the movie by telling you that with teeth gritted, Cheryl Strayed allows the hiker to toss away almost everything she thought she would need to survive. And she did survive. Her pack was lighter; her burden less burdensome. She became freer, more nimble, adaptable to the changing conditions of the trail and able to count on herself, not the stuff she had held on to so tightly, to find her way. Who can be for us the hiker on the trail, who can sit with our pack- our overflowing storage closets or events and programs that used to be vital but no longer are. Who can help us see it all for what it is? Obstacles on our Way into discipleship, into life abundant, toward life eternal. Who can help us see that the tighter we hold on, the more we have to lose? Over the past two weeks, I have watched, via social media, a dear acquaintance from my past prepare to die. She turned 39 last week, and her abdomen is filled with cancerous lumps that the surgeons cannot remove. She has been fighting gastric cancer for two years. In a previous operation, her stomach was removed. She went through chemo and radiation. There was a moment of hope, when we all held our breath with cautious optimism. But it wasn’t to be. Rachel has lived in San Francisco these past few years. She is an oncologist, if you can believe it, ushered there by her desire to prevent the cancer that killed her mother when Rachel was only 12 years old. After graduating medical school in the top of her class, she received a prestigious fellowship and chose to live in rural China, treating drug resistant disease in a brutally impoverished community. Rachel is in hospice now, and she is shedding the weight she has carried. Her apartment and belongings in San Francisco. Her job. Her hobbies and passions. She has traveled back to St. Louis to be with her dad and her sister. She is, in some ways, lighter than she’s ever been. Her life has become small and sharply focused. No more social media. No more overbooked calendar. No more vacations to exotic places. Whether she knows this or not (and I suspect she knows it), Rachel has taken a look at my pack, and at the thousands of packs on the backs of the people she has loved over these too few years, and gently encouraged us to unburden ourselves. 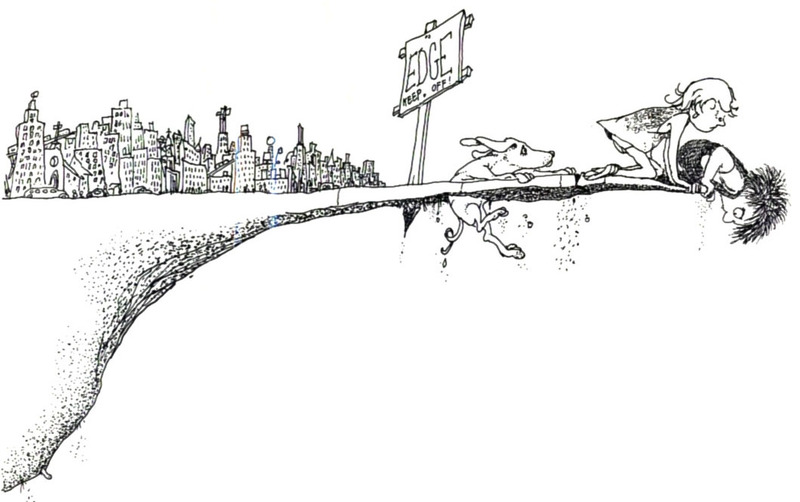 She is walking ahead of us now, and she’s seen the way and all its beauty and all its hardship, and she knows what little is needed to make her way forward, toward a place whose opening is as slim as the eye of a needle… just enough room for her to slip through. God has promised to be there for us on the other side of that narrow opening; we can count on it. But God also cares about us today, and doesn’t mean for us to grieve all the plans we’ve made for the perfect life and lose sight of who and whose we are. We are God’s. We are beloved. And that’s all we need to take with us. It is a gift being offered, not a punishment. An invitation, an open door. To feel our pack light upon our backs and the way stretched out ahead of us, bright and fearless and extraordinary.